Bought some fresh peonies at the local grocery store the other day. I've painted this type of flower before, but not very often from life. They are quite challenging because it's easy to get caught up in the hundreds of petals, so it's important to simplify. Try to get the big patterns of light and shadow, the overall structure and a few of the distinctive petals so you capture the essence. In reality, flowers are changing by the moment, especially if you have them under a direct light in the studio, so if you miss a few petals, it really doesn't matter. Capturing the spirit of the flower is what's important. They say where there's a will, there's a way and I believe that. I was recently introduced to the distinction between being interested in something and being committed. When you are interested in something, you will do what's convenient. When you are committed to something, you'll do whatever it takes. Might be a useful inquiry, not only when it comes to art, but all areas of life. Is there any area that you could choose to upgrade from being interested in to being committed to? July 4th is upon us and we're looking at a week of temperatures in the mid 90's in Atlanta, so no denying that summer is officially here. One of my favorite signs of summer though is the return of hydrangeas with all their luscious colors. What's your favorite sign of summer? My July edition of "Bringing Beauty to the World " will be released July 1. 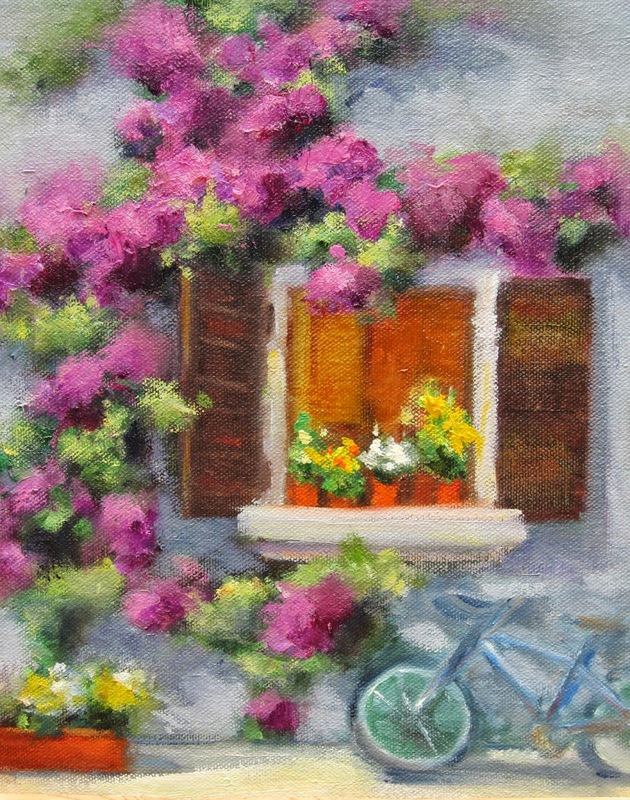 If you would like to be included in new art, upcoming workshops and ideas and inspiration to bring more beauty into your life, you can sign up for my free newsletter on the bottom of my website home page. 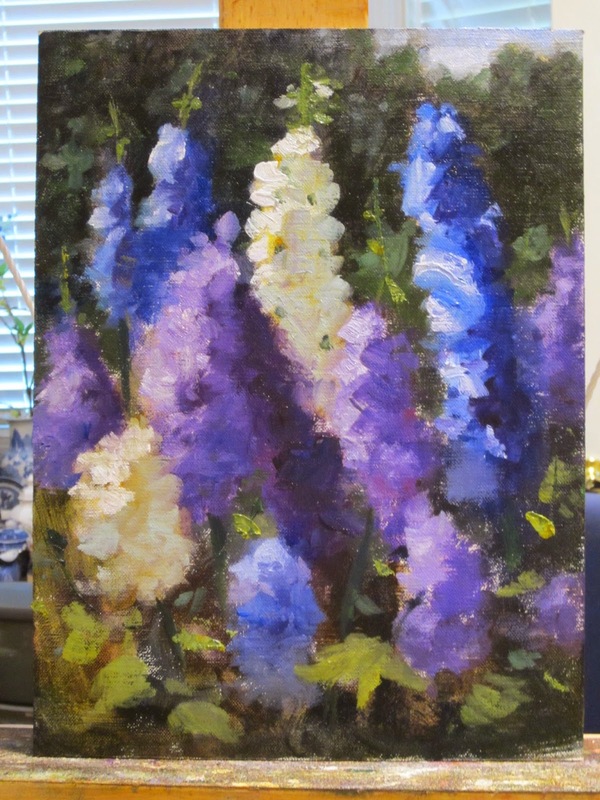 Had done a scene of delphiniums in the garden the other day (posted on June 22nd). 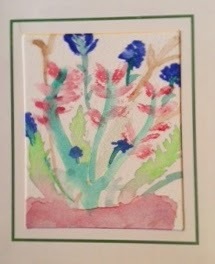 I had initially selected a vertical format to reinforce the distinctive height of these type of flowers, but it felt a little constrained to me, so I decided to use that painting as a jumping off point and create my own garden re-designed in a square format. Here's the other version. The first one has more movement, but I think the square format has more breathing room to give a rhythm to the different size and color flowers and is a little more colorful. What do you think? do you have a preference? 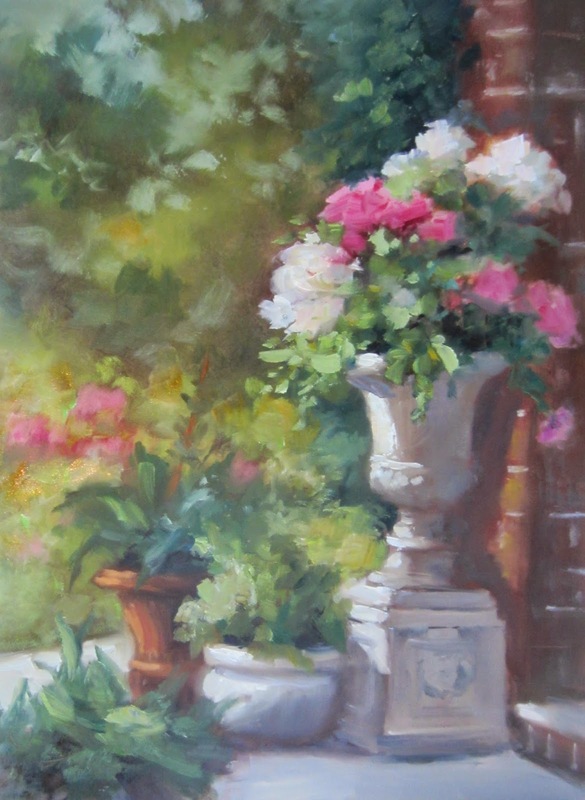 This is exactly the type of scene I love to see and love to paint-a dreamy, romantic garden, flowers, some urns and architectural accents as contrast to the softness of the foliage, sunlight ( I improvised, the original reference photo seemed like an overcast day, but why not have life be sunny?). Thanks to Anik Keuller of Anik Designs for sharing her photo with me and giving me permission to use it. I also created a short you tube video to share the process I followed start to finish. I don't always approach every painting the same, but this gives you and idea of how I created this one. 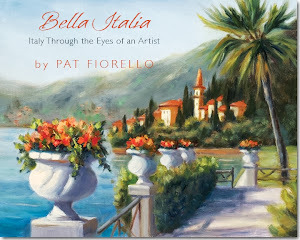 If you enjoyed it please share with others and like my Pat Fiorello, Artist Facebook page for more on art, beauty and inspiration. Thanks! Some paintings just naturally seem to paint themselves. Not this one. It sat in my studio scraped down, half finished for several weeks until I went back to it yesterday. The background was originally a dark brown which really didn't seem to work, so I mixed up a slate blue-grey which seemed to bring things back to life. Lesson learned, if I either don't have the real thing to paint from ( the best case scenario) or a really good photo of shadow and light patterns, odds are it's going to be a challenge. 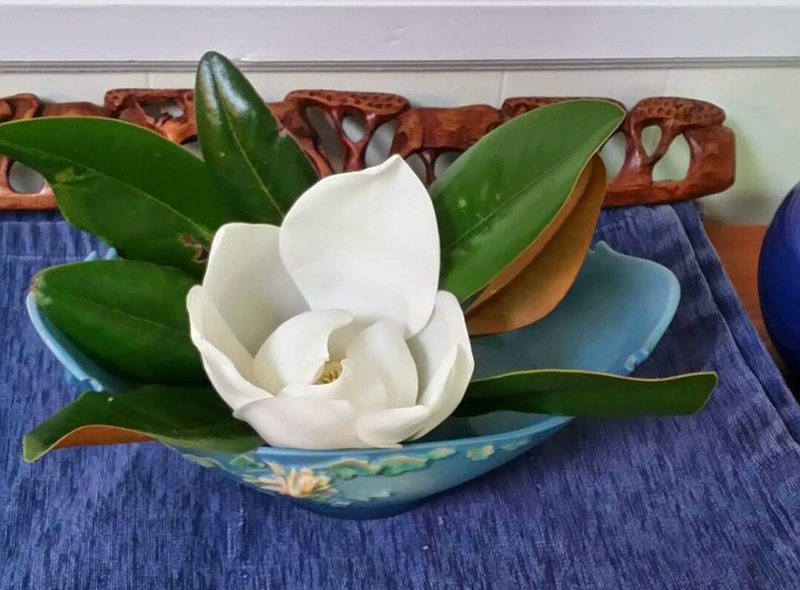 One of my friends, Linda, just moved and was delighted to have a magnolia tree on her property. She posted the photo below on Facebook to share her delight with the magnolia blossom and invited me to paint it. I took her up on the challenge and did this small study yesterday. I eliminated the dish and background and just focused on the blossom and leaves. thanks for the challenge Linda! 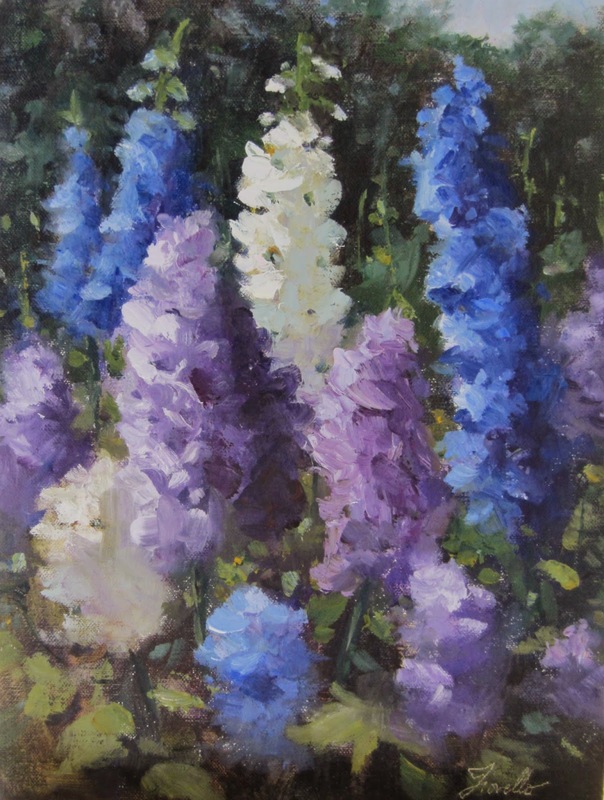 Delphiniums in sunlight based on a scene I'd seen at Callaway Gardens while teaching a workshop there a few years back. Started with a color block in to position the flowers. Assumed a cool light. Finished blocking in the background, keeping it dark and a bit on the warm side. Lifted out where some lights will eventually go. Started laying in shadows, trying to stay in an abstract phase. 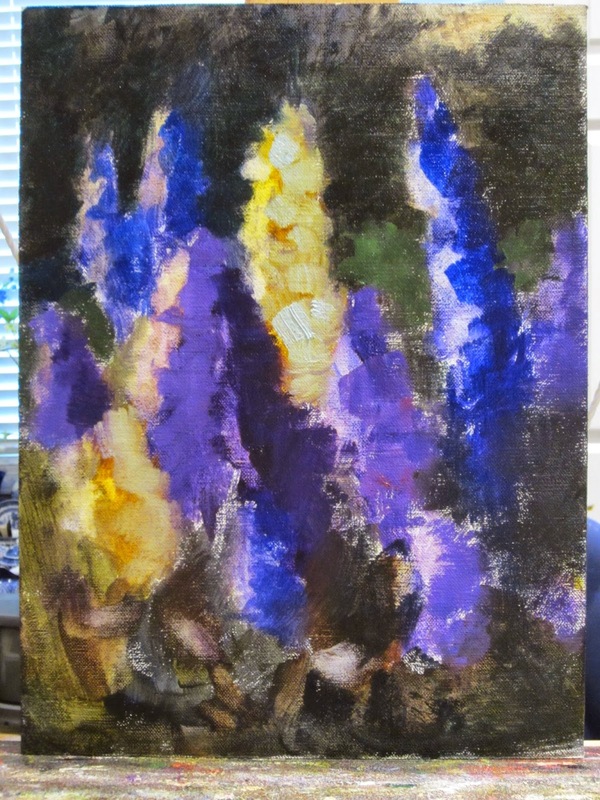 and the final touches of adjusting some shapes and edges (some hard and some soft) resulted in the finished painting, "Dance of the Delphiniums" shown at the start of this post. Mindful of restraint not to overdo it on details and petals. 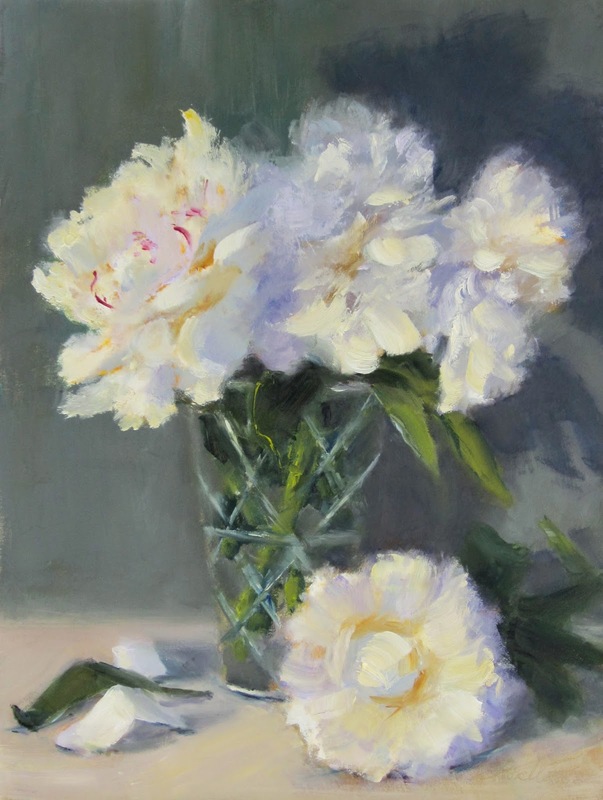 My original intention for this painting was more about conveying the abstract pattern of light rather then a realistic portrait of these specific flowers. Hopefully you have followed some of the suggestions in my earlier posts on what you can do to make the most of your experience before and during the workshop and you have had an inspiring and enriching workshop experience. But the biggest part of your learning can actually come after the workshop. So don't put your notes and new supplies on the shelf and go back to exactly what you were doing before. But be open to considering how you might integrate what you learned into your work moving forward. A rich workshop with a skilled instructor can serve as inspiration, experimentation and growth long after the workshop ends. Print out your notes( I typed them on my ipad, but handwritten is fine) and review them. I often highlight my biggest takeaways from the workshop. I also move any photo's from my camera to my computer and make a folder with the instructors name on it so I can easily go back and find images from that workshop if I am wondering about something at a later date. This is especially helpful when you've taken a series of step by step photo's during a demo. Consider one or 2 things that you might incorporate into your painting process and try them out for awhile. Don’t try to throw out your entire process and totally follow someone else’s. I try to integrate things that I think might make a difference. Sometimes they stick and become new habits and other times they don’t. But you won’t know till you experiment. If you can have some time after the workshop set aside for experimentation, that’s a great way to reinforce what you learned. I try to experiment with just one or 2 new habits or work practices to focus on practicing with those and evaluating if they work for me. Integrating more than that at once may make it less likely to stick. It's like committing to a new health care regimen and then saying I'm going to exercise 7 days a week, go for a 2 mile walk every day, use a personal trainer 4 times a week, eliminate all gluten, meat and sugar from my diet starting tomorrow. They might be good actions to take, but how likely are you going to be able to stick to this much change at once. Little steps, followed consistently ( they say 21 days- I wonder if that translates to 21 paintings?) help you to change habits over time. If there were new materials you tried and liked, you may want to order some more to practice and see how you like them over time. I recently went to a workshop where I was introduced to a new type of canvas panel which the instructor provided during the class. I seemed to like working on it in class, so ordered some more to get a better idea of how they compare to my current canvases over time- don't know if I was really in a position to make a call after just 2 or 3 exposures to this new material with all the other variables of a workshop environment at play. At home, in the comfort of my own studio, with no time constraints or other distractions, I can more realistically assess the new panels. You may want to follow up and connect with some of the people who you may have especially bonded with during the workshop. Send and email or connect on social media to have a way to keep the conversation going after the workshop. It's often helpful if you have questions about something that you forgot or doesn't seem clear to have someone else who was there to ask and vice verse. Several of my artist friends are people I met in workshops 10 or 15 years ago. We've helped each other over time and stay in touch. So the relationship does not have to end just because the workshop is over. I hope the tips I've shared over the past 4 blog posts on how to get the most value from your workshop experience have been useful for you. If I can be of any help to you on your artistic journey, please get in touch with me. My website is www.patfiorello.com or you can message me on Facebook on my page, Pat Fiorello, Artist. P.S. If you'd like to receive a copy of my monthly newsletter "Bringing Beauty to the World" where I share new art, upcoming workshops and inspiration on art & beauty, you can simply sign up where indicated on the right hand side of my blog or the bottom of my website home page. Thanks for your interest. 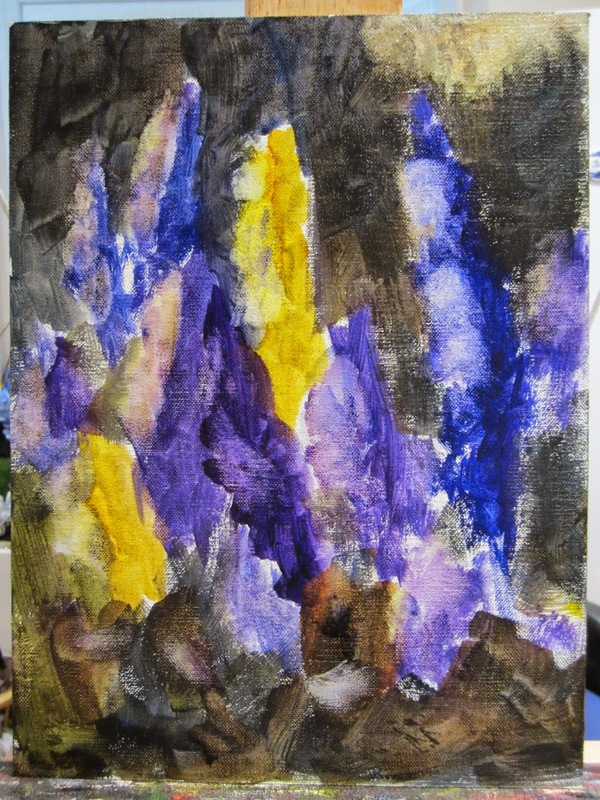 This is a painting I did this week in the spirit of experimenting after the workshops. I just played around with edges and pops of color for fun without any attempt to being super realistic. If you've been following my posts the past few days, we covered how to get the most out of your art workshop experience before deciding to go and as you prepare for the workshop. Today we'll focus on how to maximize your learning experience while you are in the workshop. Arrive on time, be prepared and be open to things that might not fit into the way you already know or do things. That’s the whole point of doing this. An attitude of “ I already know this” is the fastest thing to kill the possibility of growth. Take on what’s sometimes referred to as a “beginner’s mind”. That’s how master’s grow. They take on that they know nothing and are a sponge to wonder and soak in all sorts of new contributions. Kind of like a child seeing something for the first time. Take notes on tips and aha’s. Now with an ipad it’s easy to take notes and have them ready to print- no need to try and decipher your handwriting a year from now. I also take photos of various steps along the way during a demo so I can be reminded of the process used. Get to know other participants in the workshop. Sometimes you can learn as much from them as you do from the instructor. And I have developed friendships that go back 15 years with people I met at workshops. The experience can often be a bonding one between kindred spirits. Often emails are shared at the end of the workshop and in this time of social media, you can stay connected via Facebook and other on-line communications. In the next and final post in this series, I'll share some tips for how to keep the learning going once you get home. Feel free to share any other tips that have been helpful to you and might be useful to others reading this blog. Thank you! In yesterday's post I shared what to consider before selecting an art workshop. Today we'll look at a few things to keep in mind as you get ready for the workshop. Set an intention for what you want to work on in the workshop. Instructors will have many things to offer from technique, to materials, to work habits to composition to inspiration to career advice and more. Sometimes the sheer volume of new concepts and tools is overwhelming, but if you pick one or 2 areas that you really want to focus on, you will get those and anything beyond that will be gravy. Look over the instructors workshop supply list closely. Often the specific brushes and paint colors are only a suggestion, but sometimes what seems like a new supply may actually be critical to the approach this instructor uses. so see if you can determine what is essential vs. suggested. This way you won't spend more than you need to, but also won't miss out on experiencing any new approaches or colors that are integral to the instructors method. That's part of what you are there for. To go outside of your comfort zone and try new things, so be prepared with what you need to be able to do that. If budget is a concern. perhaps there is another artist you know who is going to the same workshop and you can share some supplies. For example, if there are 4 unusual paint colors that you don't have, perhaps you and a friend can each buy 2 of them, then share during the workshop. 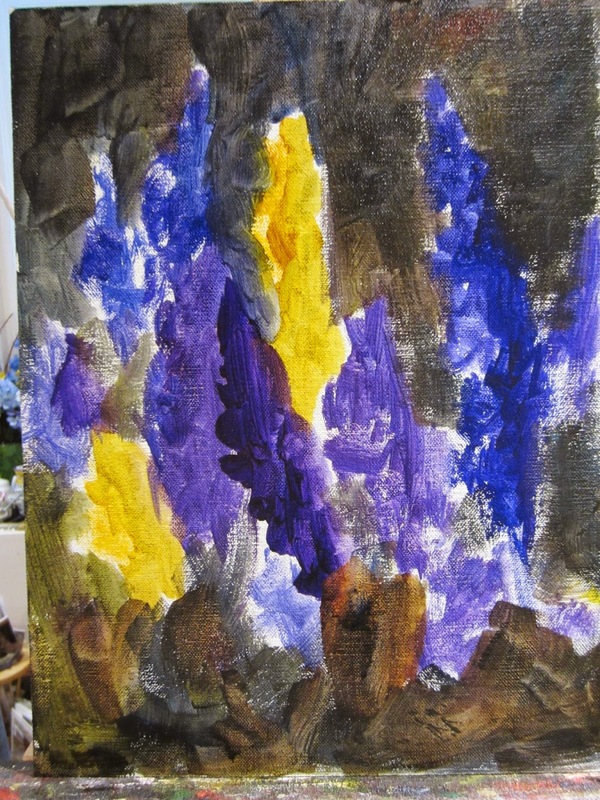 You may find that you don't connect with those new colors enough to include them in your painting repertoire after the workshop, so you may be glad you didn't invest in a full tube of everything. I have often shared gamsol or other solvent, mediums with other students while traveling. If there are things you can't take on the plane with you, you hate to buy it at your destination, only to use a small bit and then toss the rest. Often other students are happy to chip in so that you don't have to toss a lot of expensive materials that you can't bring home with you. Over the past three weekends I have taken 3 painting workshops with different instructors. I wouldn’t necessarily recommend doing them that closely to anyone, especially not for beginners, but it just so happened that 3 artists whose work I admire and have been on my workshop “bucket list” all were offering workshops in driving distance of my area, at a time when my schedule was open. I have no classes of my own scheduled for June and my husband is traveling so I have taken this month to be completely immersed in art and learning. With this experience fresh in my mind, and having both taught and taken many workshops both near and far over the past 20 years, I thought I’d share some tips on how to get the most out of your workshop experience. I've divided my suggestions and lessons learned over 4 posts. Today will be before you decide on a workshop. then in my next 3 posts I'll share how to get the most out of a workshop before, during and even after the workshop is over. Hope you'll follow along and share with artist friends who might find this information useful. Start with your intentions. Why do you want to take a workshop? Don’t pick a workshop just because that everyone seems to be following that instructor right now. Be more selective and identify who might make the biggest contribution to your next level of growth as an artist. At different phases of my artistic development I had different goals. In the early days, I was looking for basic techniques and people whose style and subject matter seemed to be similar to what I thought I was interested in. Later on I actually took some workshops from people who had a radically different approach, just to push myself out of my comfort zone and try something totally different. Sometimes I go to workshops as a jump start for motivation or even just an opportunity to travel somewhere I’ve always wanted to go (e.g. Bermuda- thank you Mel Stabin!). I have found it really useful to take a workshop in January to get my momentum going again after the holiday break when my painting rhythm often gets interrupted. I also have an area of focus in my mind in terms of my “growing edge”. Where do I want to focus to advance my development? Lately my focus has been oil painting and specifically attention to color temperature and brushwork. So no surprise, the instructors I have studied with over the past few years excel in those areas. Also, look on line- not only at the instructor’s site to see their work and philosophy, what is important to them, but also Google their name and see if other artists that have taken their workshops have shared their experiences on their blogs. I have found artists very helpful on providing feedback on workshops; so don’t be shy about contacting them. Try to get references from people who have actually taken the workshop. There are some amazing artists who may not be as effective in communicating the why’s and how’s to others. Find out the intended audience. Is the workshop targeted primarily at beginning artists, what is the instructor's approach- can you get an idea of how much demonstration time vs. painting time so you know what to expect? You may even want to find out how many students are expected to be in the workshop. I've been surprised to walk into a couple that had 30 or more students, so not a lot of time for the instructor to work with you individually if that's something that's important to you. Do you have any other tips that have been helpful to you in selecting an art workshop that you'd like to share? Please feel free to leave a comment. Feeling inspired tonight after completing a 3 day oil painting workshop with Qiang Huang. The painting above is one I did while in teh workshop yesterday. Qiang (pronounced Chong) is an amazing artist and an excellent instructor. While he is very accurate on shapes, value, color, and has a wonderful sense of design for his compositions, what I think his true genius is is how he handles edges. This elevates his work from merely a realist "portrait" of a still life, to a true piece of expressive art with a sense of life and mystery. Here were Qiang's demo pieces from the workshop. The first 2 were more in the traditional style he's know for, with dramatic values and dark backgrounds. Today he did something totally different, a colorful high key painting with a light background. I thoroughly enjoyed the workshop and am inspired to keep working at consciously making choices when it comes to edge work to bring a more "painterly" look to my own work. The thing that non-painters might find hard to believe is that it is harder to make a truly wonderful painterly/loose piece of art than it is to make a realistic painting. The masters we marvel at, like Qiang in oils and Charles Reid in watercolor, who I have also studied with, Richard Schmid (and I'd bet John Singer Sargeant, Sorolla etc.. if we could have watched them paint) work very hard and deliberately to have their paintings appear loose and painterly. Their paintings appear casually and spontaneously done, but believe me it's no accident. It requires careful design choices, concentration and self restraint to say more with less. Thanks to Donna Thomas, owner of the Art School in Sandy Springs for bringing such a great talent for us to learn from here in Atlanta. Saw some lovely poppy fields in Provence last month. Did a small study today. Look forward to scaling it up larger so there will be more room to get in all the exciting texture in the poppy field as well as more of a sense of depth, but I'm happy with the overall composition so far. 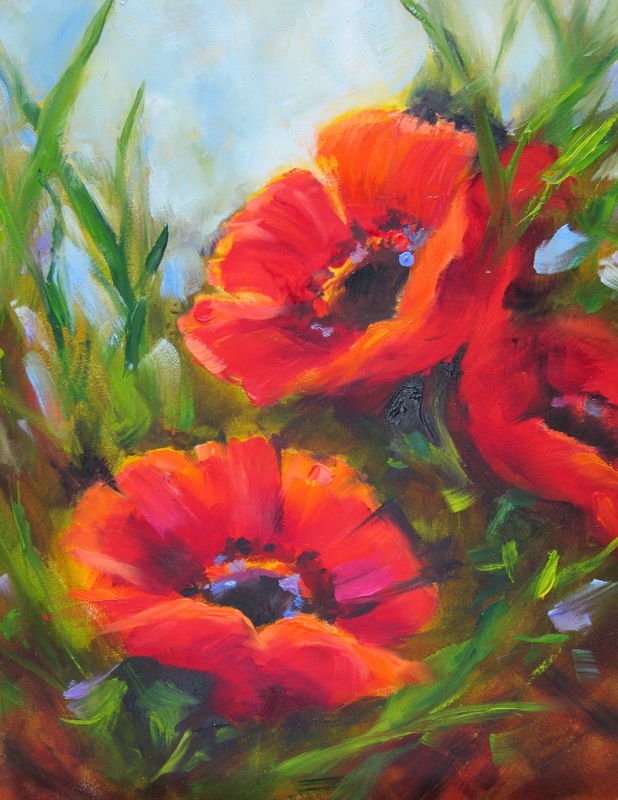 It brings back the fun feeling of seeing the brightly colored poppies dancing in the breeze. One of my painting collectors had seen my painting of this scene in Florence. It reminded her of her time in Florence on her honeymoon. The original painting had already been sold. She asked if I'd do another similar scene for her and I was happy to do so. I love to do commission paintings , especially when the scene is one that is personally meaningful to someone. The painting process and learning are personally enjoyable and satisfying, but it is also satisfying to create something that you know will meaningful to someone else and will provide a bit of joy in their life. I thought this was a fitting painting to share today since Florence is symbolic of the Renaissance. And it was 20 years ago this month that I had my own personal Renaissance and discovered painting. I was 34 at the time, working as a Marketing Director, hadn't painted since elementary school where my art teacher yelled at me for not cleaning up the paints and that was the end of my interest in art. I took my mom on a trip to Canyon Ranch for her 65th birthday (that's how I know it's been 20 years, she turns 85 in a few weeks). It was on that trip that I took a one hour watercolor class and then went out to paint the next day and by then I was hooked. Of course since I hadn't painted since elementary school my artwork picked up where I left off and it looked like a child did it and it should be under a magnet on somebody's refrigerator. But the experience was fun and energizing and relaxing all at the same time. 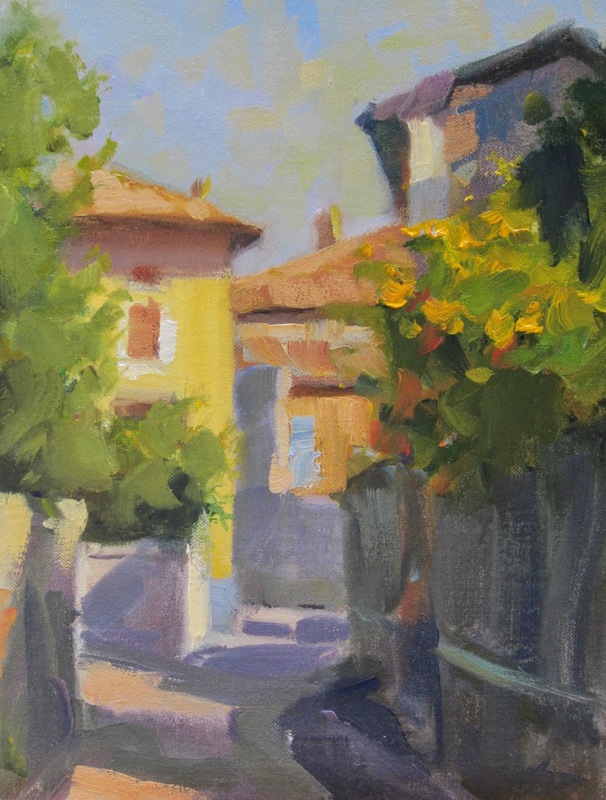 From there I signed up for an evening painting class after work one night a week, read books, took weekend workshops and then went on my first workshop in Provence (I had no idea what I was doing and just signed up, not realizing that most of the other people were "real" artists) . But that trip was a defining moment. I loved being totally immersed in painting and not much of anything else for a couple of weeks. 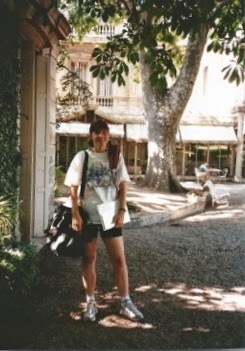 I made a vowed at the end of that trip 19 years ago that I would go on a painting trip every year- and I have- first as a student and more recently as an instructor. So looking back, it's been an amazing 20 years of growth, fun and enriching experience. Through my journey with art, I feel very aligned with my life's purpose of creating a world of beauty, love and inspiration. I thought I'd share some photo's of then and now. My first workshop in Provence and one of my "refrigerator art" paintings (it was my idea of flowers) from that first day 20 years ago and then a more recent photo and one of my recent flower paintings to share how far I've come. And perhaps inspire you. If you want to paint, you can learn. You just need the passion to be persistent, get some good instruction and most of all lots and lots and lots of BRUSH MILEAGE!. Thank you so much to all my instructors, students, fellow artists, husband Peter, family and friends who have encouraged and supported me in living an art-filled life! I truly and grateful for your belief in me. I appreciate that I could not have the beautiful life that I have without you in it! Art has changed my life and I hope it has touched yours as well. Hence the name of this blog "Art Elevates Life" . Whether you create or appreciate other's creations, art really can enrich your experience of life. In the spirit of learning, I went back to the same scene I painted the other day in my workshop. 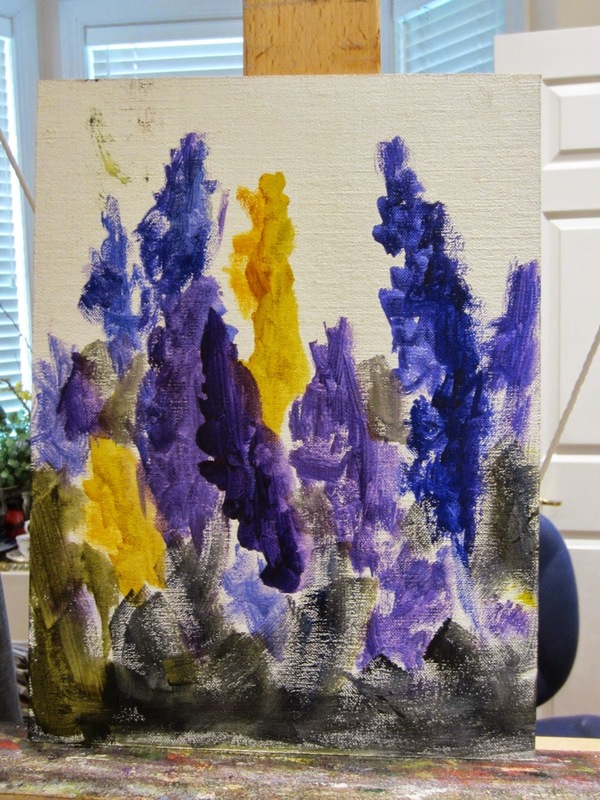 On my blog post on Sunday June 8, I shared both a painted I did in a workshop and how my instructor made some changes to it. Both versions had their own merits. but I decided to go back and do another version of the painting incorporating some of the feedback my instructor provided, but doing it in my own style with my own brushstrokes. 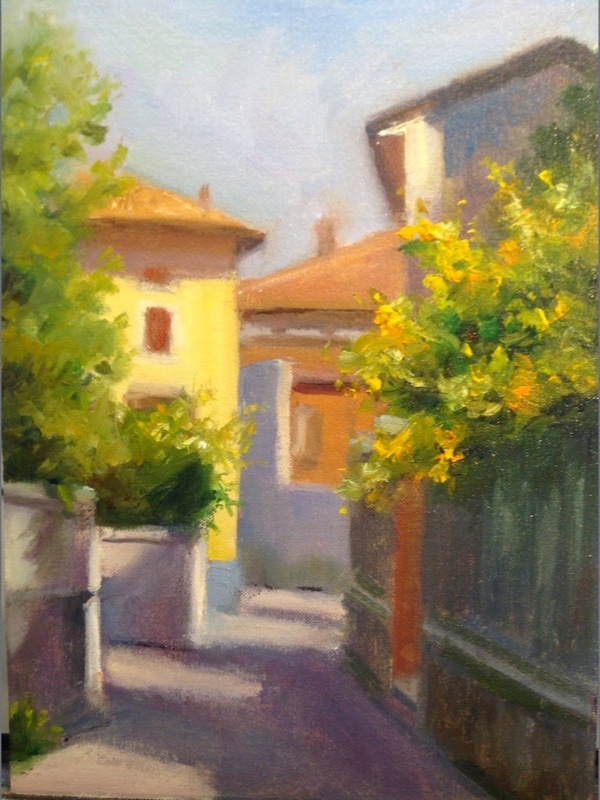 Sunny Italy, Take 3 is the result of that process. 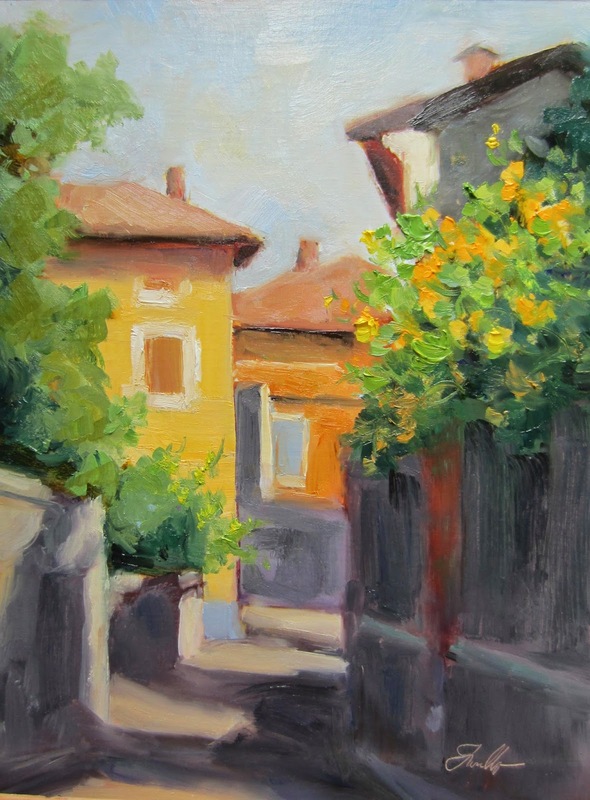 I tried to keep it a bit simpler than my initial version, but to me the excitement of the scene are the plants in sunlight (Scottish broom in Italy) so I brought some more activity back to that area. Here are version 1 and 2, so let me know if you have a favorite and if so, why. Thanks! A small study of a memorable scene from a visit to Pienza Italy. Turned down a quiet street and to my delight saw this lovely plant illuminated by the sun in the midst of shadows. Light has the power to show beauty and make thing sparkle and glow. I like the overall pattern of light and shadow so I plan to turn this study into a larger painting . Here's one from last week that I haven't had a chance to post yet. Red Poppies done in Nancy Medina's fun workshop. Started this painting yesterday in a workshop I'm taking with Jim Richards, an excellent artist and instructor in Decatur GA. 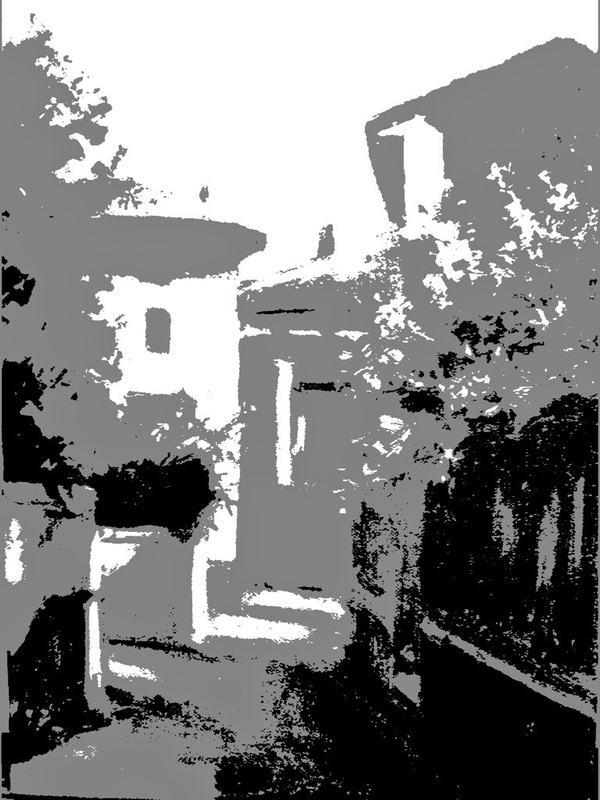 I was attracted to this scene of Italy because of the distinct pattern of light and shadow as shown in the value pattern of the original photo below. the more I paint, the more evident it becomes that I love painting the drama of light and shadow. I'm not as excited to paint something on a dull day. Although Jim has been sharing a new view on that so I may experiment with some more "local tone" scenes that I might have passed by due to lack of prominent sunlight in the past ( will post any learning from experiments in future blog posts so stay tuned). After getting as far as I did in the painting above (noted work in progress), Jim came by and helped me to simplify the scene and get an even better read on the light and shadow. Just a few things he did make a big difference. Today is another day of the workshop and my aim will be to paint looser, use bigger brushes, focus on larger, more connected shapes. Stay tuned for what develops. Thanks Jim for a great day of demonstration and painting! The last memory, seen at the bottom of the hill as we boarded the bus to leave Gargnano, after last year's Lake Garda workshop. It was very early in the morning so not ideal sunlight, but thought I'd give it a try anyway. It was the first time all week the shutters were open and there was a warm glow inside. I'm going to look thru my photo's and perhaps find one with more extreme shadow and light and paint it again larger. 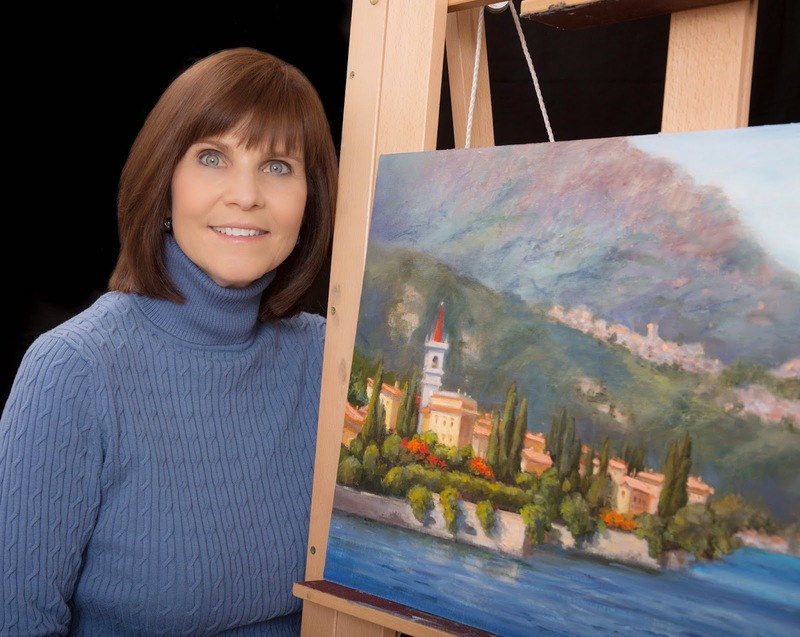 I'll be teaching another workshop at Lake Garda in Northern Italy, September 24- October 1, 2015, so mark your calendars if you'd like to join in the fun and let me know so I can include you on the interest list to save your space once registration opens.